Well, it’s happened again – Apple’s online store went down briefly this morning, meaning that the secretive company was stocking its virtual shelves with new product. As expected, when the curtain was pulled back, we all had new iMacs staring us right in the face, and they brought with them the customary slew of incremental upgrades over last year’s models. If you were paying attention when Apple refreshed the MacBook Pro earlier this year, a lot of this is going to be familiar to you. There were two major improvements in the MacBook Pros that made most of the headlines: an upgrade to Intel’s new Sandy Bridge processors, and the introduction of the new Thunderbolt port in place of the former Mini DisplayPort. Formerly code-named Light Peak, this Intel-developed port enables two-way 10Gbps transfer speeds between a variety of devices while also maintaining compatibility with existing Mini DisplayPort dongles and cables. To see more about the particulars of Thunderbolt, you’ll definitely want to read the extensive write-up we did about the technology when it launched in the 2011 MacBook Pros – everything written there is true of the port in the new iMacs. You’ll definitely see Thunderbolt crop up in other Macs as the year goes on, and you may start to see it pop up in PCs as well depending on how quickly people jump on the bandwagon. Until then, use of the port in peripherals is and will probably continue to be rare, so the more immediate concern for us is the hardware upgrades in the new Macs. 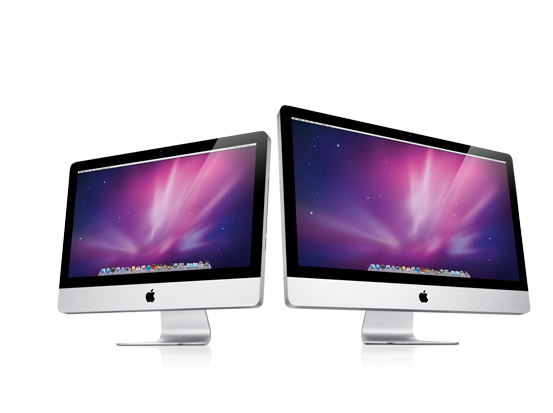 All iMacs now come packing quad-core Sandy Bridge processors, dedicated graphics with 512MB or 1GB of memory (the high-end 27” model can also be configured with a 2GB 6970M), Thunderbolt (one port in the 21.5” model, two in the 27” model), and an HD Facetime camera (which supplants the previous generation’s iSight camera, making the white MacBook Apple’s last product to carry the iSight branding). Update: Reader emails have alerted me to an iFixit teardown of the new iMac, which reveals that they're shipping with the new Intel Z68 chipset. We wrote a little about Z68 earlier this year - no word on whether OS X supports or plans to support any of its unique features at this point. It's too bad to see that all iMac models across the board still come with 4GB RAM installed by default, and Apple's upgrade prices for memory remain ridiculous (bumping it up to 8GB across two 4GB DIMMS costs $200; market value for 8GB DDR3 kits is about $80). At least these iMacs continue to offer four RAM slots, versus the two slots on older iMacs - if 4GB is not a suitable amount for you, adding another 4-8 GB is easy and relatively inexpensive if you don't pay Apple's prices. All of these internals are packed into a case that’s virtually identical to the aluminum unibody iMac design introduced in 2009, which itself was a gentle retooling of the aluminum iMac introduced in August of 2007. The point being, this refresh is all about the hardware inside: you’re not getting anything drastically thinner or lighter, and if you’ve seen an iMac in the last three or four years, you should have a pretty good idea of what you’re buying. Prior to the MacBook Pro refresh (and excluding the Mac Pro), the iMac was Apple’s only product line to transition completely away from Core 2 Duo processors to newer Nehalem-based Core i3, i5, and i7 processors – the white MacBook, the Mac Mini, and the MacBook Air lines continue to use the Core 2 Duo along with nVidia chipsets to save space and energy, and to get around using Intel’s previous-generation integrated graphics processor. So the iMac wasn’t as far behind in CPU architecture as some of Apple’s other products, but the switch to quad-core processors across all models and price levels should give new customers a healthy speed bump over the previous generation. As we saw in our review of the Sandy Bridge MacBook Pros, Apple makes use of Intel’s Turbo Boost feature to make up for the quad core parts’ lower clock speeds relative to dual core parts in single-threaded applications. The Sandy Bridge and Thunderbolt upgrades are more or less known quantities at this point – what impressed me most about the new iMacs was the GPU upgrade, especially in the entry-level iMac and the high-end iMac. Here's what I just bought for $1400. You'd have to get a top of the line iMac to match those specs. I've owned 3 Macs before and I find it hard to spend that much on a desktop when you are knowingly getting ripped off. At least with laptops, one can justify that no one builds a better laptop than Apple (especially since you can't really build your own from scratch). You bought a Vertex 2 to go with a Sandy Bridge machine, and you read AT? Look at the low end model, Apple's price is not that a rip off. all the price below is approximate price with reference. You can easily get a *crappy* 23 inch monitor for $250 or under, not a 21.5 inch.